That cute trailer wasn’t the only thing Nintendo did to celebrate the groundbreaking ceremony for its own theme park yesterday. 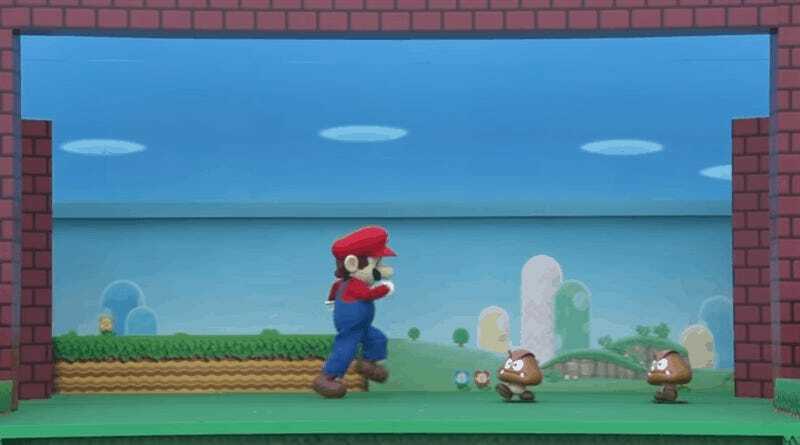 There was also this attempt at a live-action recreation of side-scrolling Mario. If the setting looks familiar, that’s because it was the reason for that stage being constructed in the Universal Studios parking lot that we posted about earlier in the week. It doesn’t 100% come together, but it definitely gets top marks for effort. Putting actual rolling blocks and a background in there instead of just using a projection is a very quaint, Nintendo touch. Stick around to see Miyamoto and some Universal execs give a very important business presentation wearing Mario hats and giant gloves. Super Nintendo World is due to open in Universal Studios Japan in 2020.